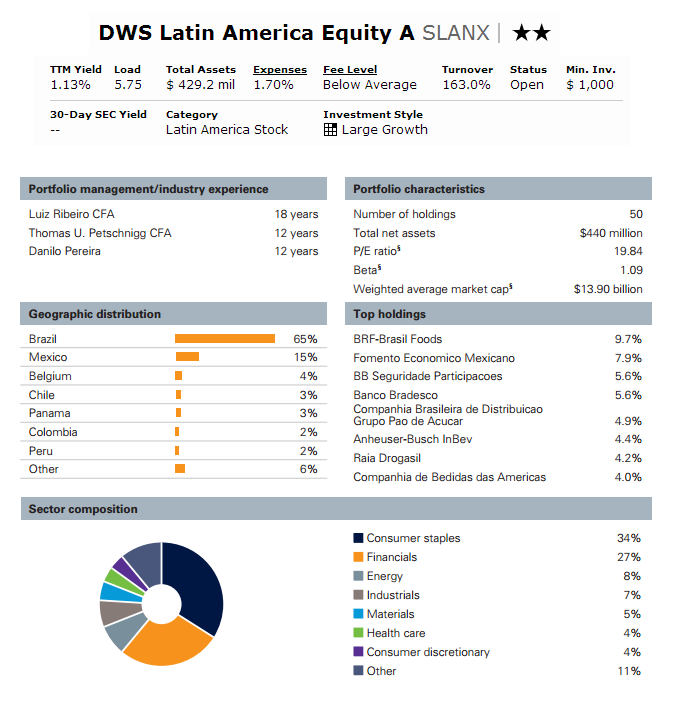 DWS Latin America Equity Fund (SLANX) is an international stock mutual fund. It invests in emerging markets stocks especially in Latin America such as Brazil, Argentina, Columbia, etc. The investment objective of DWS Latin America Equity Fund (SLANX) is to seek long-term capital appreciation. This mutual fund utilizes its assets to purchase Latin American common stocks and other equities. It may invest up to 20% of net assets in the equity securities of US and other non-Latin American issuers and in debt securities including junk bonds (grade BB/Ba and below). The fund may also invest as much as 10% of net assets in securities rated B or lower. It is non-diversified. The portfolio managers of this fund are Luiz Ribeiro, Thomas U. Petschnigg and Danilo Pereira. The fund has total net assets of $429.2 million. It shares 1.13% dividend yield and is distributed annually. The annual expense ratio is 1.70%. The average ratio in the category is 1.87%. The fund also uses Large Growth investment style. Other classes of this fund are Class B (SLAOX), Class C (SLAPX) and Class S (SLAFX). The fund requires minimum initial investment of $1,000 for brokerage account and $500 for retirement (IRA) account. The minimum subsequent investment needed is $50. There is a 0.25% of 12b1 fee and 5.75% of front-end sales load fee. The fund can be purchased from 115 brokerages. The largest equity holdings as of June 2013 are BRF-Brasil Foods (9.7%), Fomento Economico Mexicano (7.9%), BB Seguridade Participacoes (5.6%) and Banco Bradesco (5.6%). The ten largest holdings represent 53.6% of the total portfolio. The top sectors are Consumer Staples (34%) and Financials (27%). The main risks for investing in this DWS Latin America Equity Fund are stock market risk, foreign investment risk, regional focus risk, emerging markets risk, non-diversification risk, growth investing risk, pricing risk, interest rate risk, counterparty risk, liquidity risk, prepayment and extension risk, derivatives risk, security selection risk and credit risk.